Though written off by many as a Twilight copycat, The Vampire Diaries is the best thing to come out of the teen-vampire phenomenon. Prompted by the success of Twilight, ratings-desperate network The CW took a shot at its own saga based on a popular series of vampire-themed young-adult novels, albeit a much older one. (The first Vampire Diaries book was published by author L.J. Smith in 1991.) 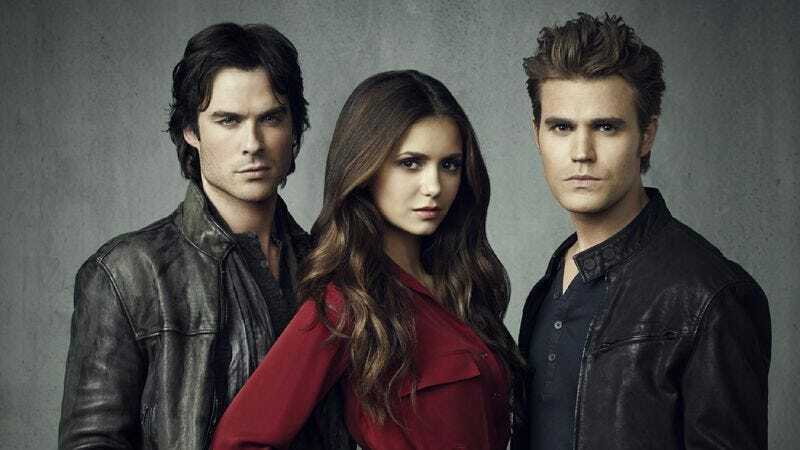 In the process, the network, along with veteran TV writers Julie Plec and Kevin Williamson, created something better than both the source novels and its inspiration. What began as a simple story of vampire brothers Damon (Ian Somerhalder) and Stefan Salvatore (Paul Wesley), who share the pesky habit of falling for the same girl (Nina Dobrev, pulling double duty as both human Elena Gilbert and vampire Katherine Pierce), quickly turned into an epic ensemble tale of family, friendship, violence, schemes, and double-crosses that churns through an impressive amount of plot. The Vampire Diaries doesn’t do standalone episodes. The beauty of the series is how, from episode one on, it has constantly built upon the episodes that came before, twisting and turning until the audience’s heads spin with each breathless act break. This doesn’t mean the series is impenetrable, however. The Vampire Diaries has cleverly implemented a structure that almost always offers a contained, propulsive individual arc for new viewers to latch onto. This technique was developed in season one but came into its own in season two, which is a master class on how to create an exciting, satisfying, almost manically paced season of television. The Vampire Diaries is practically made for binge viewing. It’s ideal for devouring in huge chunks until the viewer is glassy-eyed and drooling on the couch, barely able to hit the “play next episode” button on Netflix. But season four premières in just over a week—on Thursday, October 11—and 66 episodes is a daunting number to watch in that time. For those interested in a mini-marathon to prepare themselves for season four—or for those who are simply curious as to why their Twitter timelines devolve into a caps-lock frenzy every Thursday night—here are 10 episodes that represent the good, the bad, and the gory of one of the best genre shows on TV. “Lost Girls” (season one, episode six): Although Plec and Williamson wrote two episodes before this one (including the dreary pilot), their “Lost Girls” script feels like the show’s arrival. Splitting time between one character’s unexpected transformation into a vampire in the modern day and the story of how Stefan and Damon became vampires in 1864, the episode introduces several series staples: flashbacks, surprise murders, and, best of all, the incomparable vampire—and both Stefan and Damon’s first love—Katherine Pierce. Most importantly, it’s the first episode that’s fun from beginning to end, featuring the breathless pacing that has become the series’ signature. “The Turning Point” (season one, episode 10): As much as The Vampire Diaries revolves around wild plot machinations and rogue violence, it begins as a somewhat simple love story between a teenage girl and a 165-year-old boy. “The Turning Point” embraces this romance but smartly undercuts it with some much-needed edge, bringing Elena and Stefan together just long enough to make it hurt when she accidentally learns about her strange physical resemblance to Katherine. In addition to this romance, the episode also proves the show’s solid horror chops with a nightmarish final sequence that sets the bar for the many creepy moments to come. “Let The Right One In” (season one, episode 17): Season one centers on the search for the presumed-but-not-actually-dead Katherine, which results in numerous shifting alliances and double crosses. “Let The Right One In” introduces the wary friendship between vampire Damon and vampire-hunter Alaric (Matt Davis), a friendship that eventually becomes one of the most rock-solid relationships on the show. When Damon and Alaric team up to rescue Stefan from a house full of psychotic vampires, a permanent bond is formed, and The Vampire Diaries realizes just how fun it is to watch its characters execute a plan—a well the show goes to with triumphant results time and time again. “The Return” (season two, episode one): The first season promised Katherine Pierce, and the season-two première delivers on that promise and then some. Dobrev shines as the ruthless, self-serving vampire, sauntering in via one of the best cold opens the series has ever pulled off, then twisting everyone into knots for the entire episode, until the hour ends with her committing a shocking act on an innocent character and using it to taunt the Salvatore brothers. It’s not only a tour de force performance by Dobrev, but also a legendary character introduction, and it sets in motion one of the best-plotted and paced seasons of television in recent memory. “Masquerade” (season two, episode seven): Mystic Falls, the town in which The Vampire Diaries is set, loves a party, and “Masquerade” is a glorious example of the show’s reliance on parties to bring characters and schemes together in nightmare fashion. When the characters band together in an attempt to kill Katherine at the annual masquerade ball, they learn a brutal lesson in how she’s always at least two steps ahead of them. Meanwhile, the show’s tentative steps into werewolf legend become more prominent as Tyler (Michael Trevino) desperately tries to avoid triggering the curse inside him. All while everybody is wearing fancy costumes! “Klaus” (season two, episode 19): Because The Vampire Diaries constantly churns through plot, it often has to deal with a tremendous amount of exposition. One of the show’s greatest strengths is its ability to make that exposition compelling, a skill never demonstrated better than in “Klaus,” perhaps the best-ever example of “episode as info-dump.” It’s also one of the bravest episodes of the series to this point, as it takes the entire season’s mythology and turns it on its ear only three episodes from the finale. On top of that, the hour introduces villain Klaus (Joseph Morgan), a character who shapes the series—for better or worse—from this point forward. “The Sun Also Rises” (season two, episode 21): This culmination of Klaus’ evil plan is also a culmination of the series’ main themes: loyalty, family, and sacrifice, with death as the ultimate consequence. As much as the show’s signature twisting plots and last-minute saves share the spotlight here, what stands out in this episode is how deep the emotional implications have become for the characters, and in turn, the audience. Half crazy action and half poignant reflection on life and death, “The Sun Also Rises” breaks the hearts of both the characters and the audience for the first time, and shows just how mature a show The Vampire Diaries has become. “The End Of The Affair” (season three, episode three): Season three scatters its characters to the wind, forcing Stefan to return to his days as a terrifying killer and become Klaus’ compelled minion in his quest to create an army. In “The End Of The Affair,” Klaus shows Stefan that he wasn’t always such an unwilling partner via a series of entertaining 1920s flashbacks. It’s crucial character development for both parties, as Klaus gets some much-needed shading, and the tightrope Stefan is walking between Klaus and Elena gets even more taut. “The Departed” (season three, episode 22): The finest and most daring episode of the show to date, “The Departed” tells the story of Elena Gilbert’s past, present, and future. As the doppelgänger and veritable center of all supernatural activity in the universe for the last two seasons, Elena has survived to this point thanks to a near-constant state of alert. Here, through flashbacks to a happier time before her parents died, we finally get to experience non-doppelgänger, teenage-girl Elena. Possessing a cinematic flair often hinted at throughout the series but never before achieved, this season finale ends on a jaw-dropping note that will inform the entire series to come. It’s impressive, devastating storytelling of the highest order. Availability: All three seasons are available on DVD and Blu-ray or for digital purchase, and are currently streaming on Netflix Instant. Next week: Head into the furthest reaches of space with Alasdair Wilkins and the long-running British science-fiction comedy Red Dwarf.